Let me know how it goes – if it works for you I’ll change it in the next version. Nice but I also found a setback after the install, what could be done in this case? Thanks, Michael, that’s most helpful. Wilson: Wow, that’s intimidating. Sounds like your PHP setup doesn’t support these things called named references, which Grunge uses a bit. Could you replace your functions.php with the one in this zip file and tell me if it works? Hey! Thanks heaps for this WP design! I fell in love as soon as I saw it! As a fellow web designer from Vic, I think its great that you released this theme! Fiona: Well done, and thanks! Two other options for you: Either add a ‘noframe’ class to the images, or if they already have a class, add that class name to Admin:Design:Elegant Grunge:Don’t frame images with class (add a comma after the existing ‘noframe’ value, then write the other class in there. Or to disable framing altogether, just untick the ‘Apply frame to all images’ checkbox. Hi Sebastian! Thanks for the bug report! I see what the problem is – your images don’t have width/height attributes, which the theme uses to try to constrain image sizes. I’ve fixed the next version so that it doesn’t need it – give me an hour or so and I’ll have it up, plus better handling of the photoblog tag page when Lightbox isn’t installed, plus a widget that displays random images from the photoblog. Hi Mike, great =) thanks a lot for the great support. Okay, so not quite an hour, I’m afraid =) There’re still a few more things to perfect. love it & using it. one observation: there’s typos – looks like a copy paste error – in header.php. the title tag set is missing the ‘php’ after the ‘?’ so it just renders “bloginfo(‘name’)” into the title bar. Thanks all for the reports – Version 0.3 is now ready for download from this page (will probably be under review with the WP folks for a few days before it’s ready there). Hey, thanks for the comment on my blog! How you got over there is a mystery to me 0_o. Thing is, I had to tweak a few things. First, I got rid of the frames around images. The idea is neat, but it gets annoying fast when they start appearing around the smilies WP puts in. Secondly, headers in the sidebar (specifically the “Catagories” and “Blogroll” ones) had gotten bullets in front of them. I had to make a special CSS entry for them, because they had the tag, but not the in front of them, for some weird reason. That, and I tweaked the lineheight in the sidebar. It was waaay too much for my taste. Oh, as I was typing that; I also noticed that if I put a long blog description on, it would put part of the text beneath the “banner”. Thanks Lumi ;) The witchcraft that is Google! Ah! WP smileys would be a problem, especially if the images don’t have width/height! Oh, looky. The smileys have a class of wp-smiley – one could just add “wp-smiley” to the “Don’t frame images with class” option. I’ll make that a default in the next version, and make a note above. Sidebar headers – does 0.3 fix that problem? If not, what did you do to fix it? Perhaps I missed something..
Sidebar line height may be fixed now too, now I’m using different styles.. I’d love to hear if it fixes it. If it doesn’t, what did you tweak? Blog description – Ah yes.. I suppose that’s just a limitation of the theme. a great release :) again. But I don’t know why it seems that the IE can’t get the RSS Button up on my installation. Maybe someone else has this issue too ? Awesome =) Well, that’s a little confusing – I’m actually not sure why it works in any browser, because rss.png from the theme doesn’t seem to exist on your site. 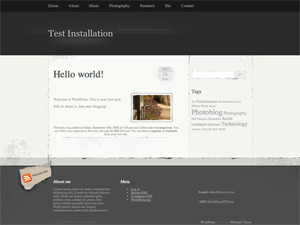 http://blog.sebastiangrass.com/wp-content/themes/elegant-grunge/images/rss.png – 404’d! So how is it working in any browser? Doesn’t make any sense to me, how bout you? Hi Mike, thanks for digging into it, but this is not the issue. The RSS Button is coming up for every other browser I double checked it with Safari and Firefox, only the IE makes some trouble for me. But nontheless I love this theme!!! It’s a pretty nice theme! Hi Micheal, My name is Mena and i liked your theme it’s very beautiful and elegant..
Hi Mena – thanks! I’m glad you like it! I’m fairly sure that’ll do it. I also suggest you flip searchform.jpg, and finally, move the message in the footer (‘This blog has been fine-tuned…’) to just above the <php wp_footer(); ?> line, or possibly even in the div with class=’credit’ – put a br after what’s currently there. Great theme! One question though- how do I get the photoblog up and running? I have no idea how to approach it. If all I do is turn on the widget after a clean wp install, it deletes my sidebar. Not quite sure what to do with that or how to use the tag-photoblog.php.